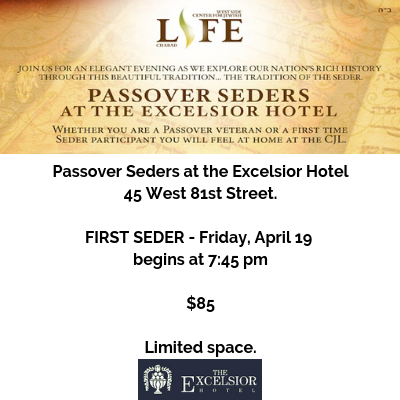 Cost per Seder: $85 for Adults, $75 for children (3-12). The best way to reach us in a way that we can guarantee to respond in a timely manner is via email at info@westsidecjl.com . We will do our best to respond within 2 hours during normal business hours. Or call 212-799-0809. The seders are under OK kosher supervision - We will be serving only handmade Shmura Matza - all food are Non Gibroks. Vegetarian option available upon prior request. Seders led by Rabbi Yisrael and Chanchy Kugel. No one will be turned down due to lack of funds - Please email us via this link if you need assistance to attend. All reservations are final.